We are two weeks out from the Pro Tour, and I have been very happy seeing how Shadows over Innistrad has impacted Standard. I will admit, I was pretty nervous seeing the first few weeks of Standard results so full of Bant Company and white weenie decks. I was very thankful to see how the Pro Tour players came out with a number of new and innovative decks that attempted to prey on some of the weaknesses of Bant Company, or just go over the top of it with bigger plays. As I highlighted in our FFL article last week, we knew what many of the players of the format could be and were happy to see them emerge. Now, this doesn't mean that the metagame is perfect, or won't become stale over time, but it looks to be much more robust than the first two weeks of Standard tournaments let on. One thing I have not gotten tired of seeing in Constructed has been all of the double-faced cards in Shadows over Innistrad. As a group, I think they are the cards that do the best job of showcasing what the set is about, and they really play up the "this is what Innistrad is about" aspect of what the two-block model and faster rotation was trying to do for Standard. It's not just Avacyn seeing play; cards like Thing in the Ice, Duskwatch Recruiter, Westvale Abbey, and Town Gossipmonger have done a good job of highlighting the wide variety of designs that can be made to see Constructed play. In today's Latest Developments, I want to talk a bit about how we got them there, and what was going through our heads as we worked on them. When I'm working on a set, each one has an element that I like to think of as the "black hole." This is the known unknown of the set, where we have an idea of what we want out of it but it's very unclear on exactly how much work it will take to get there. Relative to the rest of the set, we know that this particular portion will take a lot more time than the rest. For example, in Dragons of Tarkir, it was getting the Dragons and Dragons-matter stuff to work, and for Oath of the Gatewatch, it was the C-mana cards. In Shadows over Innistrad, the tribal elements were pretty well known, madness would be difficult but we knew what our enablers going into the set were, and delirium was a mechanic that was very well set up for Constructed. Getting the DFCs right this time, we knew, would take a lot of work—because we wanted cards like Avacyn to show up in Constructed, and any time we have a card with a ton of knobs, it's going to be hard to get them all in the right spots. Now, it may seem weird for me to say that, since we had successfully made Constructed-level DFCs in the past, but we wanted to do a better job this time, as whole. I think many of the ones in original Innistrad worked, but they didn't do the best job of showcasing just how much room DFCs have for fun and interesting designs that don't just show up in Standard, but can make it more fun. When creating DFCs this time, it was important to create not only cards that we couldn't have done with one side, but ones that had a fun play pattern. Thing in the Ice could enter the battlefield with four ice counters and tick down once per turn as it "thawed," only to have it emerge and go all RAWR on the world, bouncing all the non-Horrors. That would be something, but it wouldn't be as fun as putting the deck-building decisions on the person playing the Thing, or allowing for "will they or won't they" moments of trying to top-deck one more spell to break the Thing out. In short, if the DFCs could be handled by a mechanic like suspend, then I think they would be failing as a resource in the set. We needed to crunch on the cards a lot and do a lot of tweaking on both sides to create cards that were not just powerful, but also fun. Looking at Avacyn, for example, she is certainly a very powerful card, but she also tells an important story of the block. 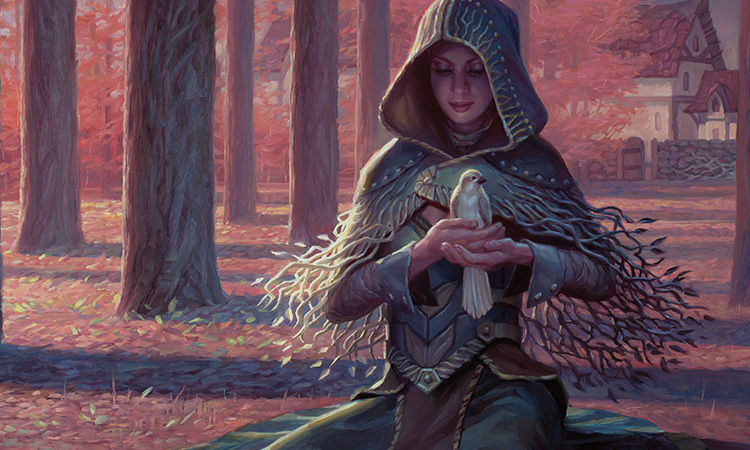 A major goal for Magic over the past few years has been to find ways for our story to play out in a larger field than just in the pages of the Magic Story. While we do a pretty good job of making our legendary creatures cool and showing our story moments on cards, DFCs actually give us the ability to do things like show Avacyn as the protector of Innistrad, show her going insane, and show her "evil" side. I really enjoy that she doesn't just kill your opponent's creatures—we took a sidestep from what we usually do in making cards all-upside, to allow potential downsides with her flip—since that is what she is doing in the story. While DFCs add a lot of fun to Magic, it's not without a cost. There is a reason we don't put them into every set—they add a lot of room for fun and interesting designs, but they also have a cost to be paid for both Draft and Constructed. Beyond the whole thing about revealing your DFCs to the rest of the table when you draft them, you also need to worry about checklist cards, properly opaque sleeves, and the physical manipulation of turning the card back and forth. As I've mentioned before, during a good portion of design, we tried two DFCs per pack. One of the biggest reasons we didn't stick with this was because of the physical complications of revealing them in the draft, as well as the increased amount of reliance on them in Limited decks. For example, in both Innistrads, we tilted the number of DFC towards the Werewolf deck, so that if you were someone who abhorred DFCs, you could ignore them without giving up too much power in your Limited or Constructed deck. We wanted to make sure there were going to be options for decks that didn't rely on DFCs. People who really loved DFCs, and who liked flipping them back and forth, could gravitate toward Werewolves. A lot of this was about trying to make as many people as happy as possible. When designing DFCs other than Werewolves, it was important for us that we maximized the amount of interesting gameplay that we could get out of transforming, while minimizing the amount of fiddliness. Thing in the Ice, for instance, when it transform, bounces all non-Horror creatures and is a 7/8, so that it will have a huge impact on the game. Westvale Abbey takes a lot of work to transform, but comes out as a large enough creature that it can actually end the game. We want these kinds of big transformations on most of our cards, so that we can maximize the amount of excitement that comes from actually transforming them. That does mean that we had to avoid certain DFC designs that would otherwise work, but would've ended up transforming too much. Werewolves get to flip back and forth—because that is their thing—but that's it. We wanted the other transformations on Innistrad to be very much one-way transformations. That limited some design space, some that was probably quite fun, but I think it was the right decision. It kept us focusing on the things that were the most fun, and allowed us to figure out an optimal level of usefulness for fiddliness. T: Add G to your mana pool. Transform CARDNAME. T: Add R to your mana pool. Transform CARDNAME. Is this balanced? Unclear. It's a little too close to a Beta dual, but it also means that you need to build your deck to more often want G on turn one and R on turn two. That's not what's really problematic about the card, though—it's the physical manipulation that it requires over and over again, constantly flipping the card each turn not only in its regular use, but to set up your next turn. Need R on turn two, make sure to tap it on turn one to get it to the right side. Or, maybe you shouldn't, because you have a green card you could cast, but you need that R on turn three. It's possible that we will design, at some point, a variant of DFC dual lands that we will want to put in a set (certainly, they have some advantages over fetch lands, which also have a large amount of fiddliness), but I think the only way to do so would be to find a design that made the physical cumbersomeness of using them secondary to how cool or fun they were to play. That's it for this week. Join me next week when I answer your questions about Shadows over Innistrad development.